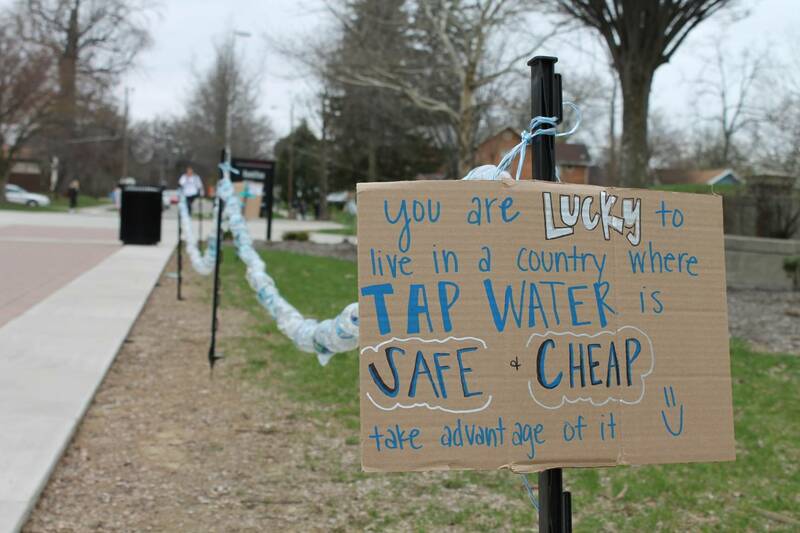 The goal was to ban the distribution and selling of disposable water bottles on campus. This original goal was modeled after the Ban the Bottle campaign going on internationally in high schools and universities. The focus of this goal changed when it did not appear to be economically feasible for Chartwells to do right now. The ultimate goal was to raise awareness of how disposable water bottles are a waste of resources. This was done over the span of a 24-hour demonstration on the Jaywalk during Green Week 2015. A part of the demonstration stayed up for three weeks after this day. Originally, I met with one of the presidents of the Wesleyan Council on Student Affairs (WCSA) and a member of Treehouse to discuss the implementation of the Ban the Bottle movement here on campus. Both were on board with the idea and WCSA had already ordered six new hydration stations the month before. The new hydration stations were being installed throughout the semester across campus. After meeting with Chartwells District Manager, Gene Castelli, this movement seemed to be a less attainable goal. 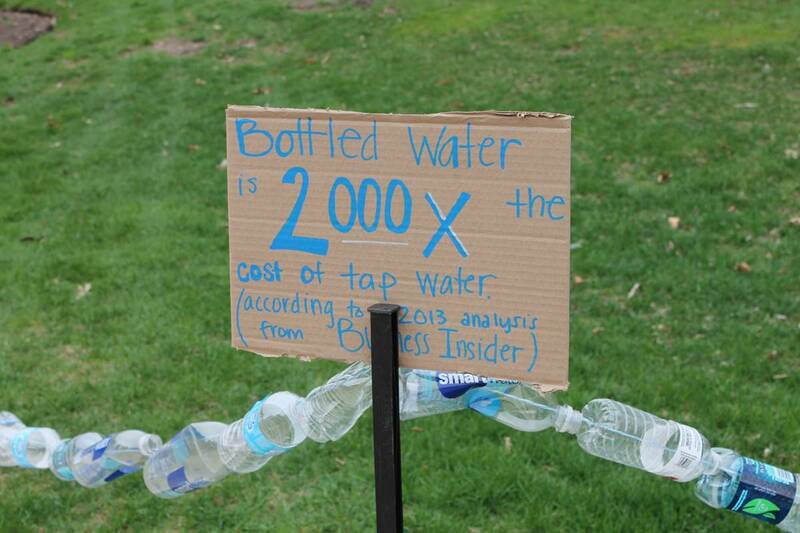 Notably though, he did say that water bottle sales had already been steadily dropping. From the spring semester of 2014 to the fall of that same year, SmartWater sales were reduced by close to 2,000 sales (1,914 in actuality). 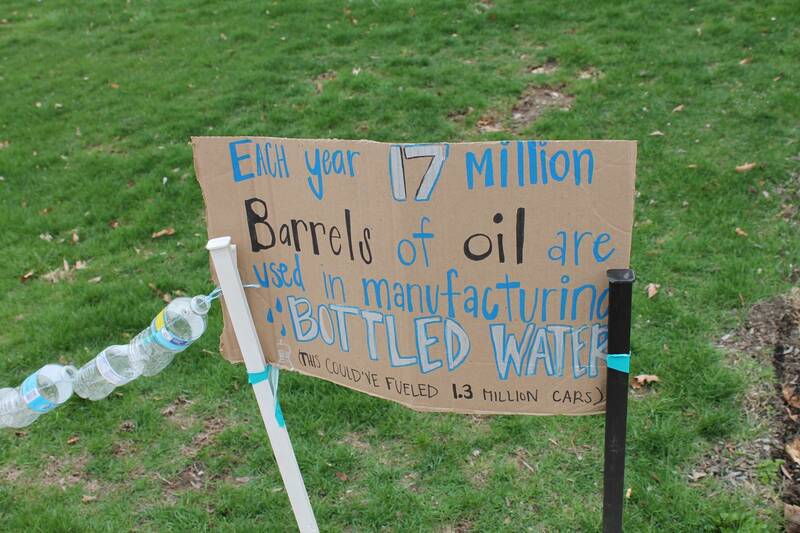 So a demonstration to further awareness of bottled water’s waste of resources began to be planned. One possibility that was briefly explored was having a recyclable fashion show with items made of bottles but that proved to be too time consuming. 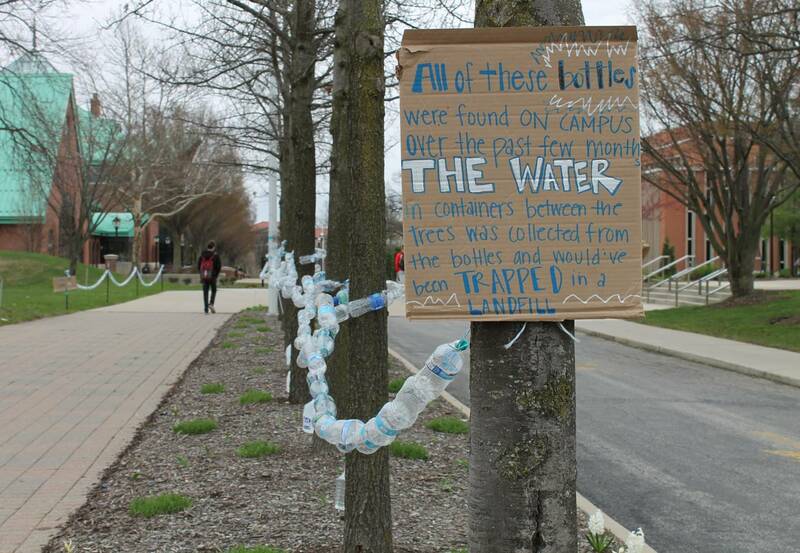 So stringing together as many water bottles as possible and hanging them across campus was decided. First, I researched the requirements to be a part of the Ban the Bottle Initiative. OWU already met one of them because they had already had a showing of the film Tapped in fall of 2014. In the meeting with WCSA, other conditions were seriously considered until it didn’t seem plausible. We realized we’d need to look into Chartwells’ contract and find any loopholes. The water bottles Chartwells sells are Dasani and SmartWater are both brands owned by the Coca-Cola Company. To no longer sell these brands, it would have to be known when the contract with Coca-Cola would be renewed and if those brands could be written out of the contract (but still include soda and other products). SInce the demonstration was decided upon, collection of bottles began in late February. A classmate put a container in the weight room on campus marked “water bottles only” and this was emptied weekly. 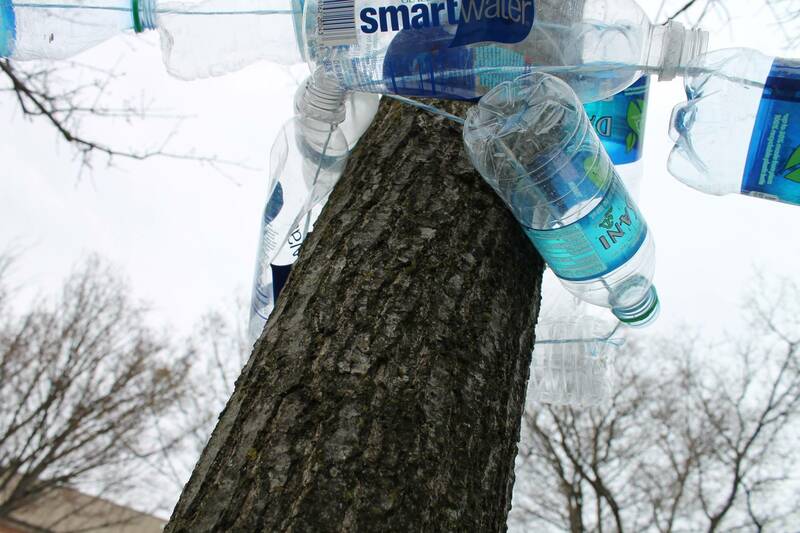 Other bottles were collected around campus: in trash bins, recycling containers, and from the ground. In total, roughly seven trash bags were collected and stored in the InterFaith House and in the Science Center. Buildings and Grounds (B&G) was contacted to get approval for the demonstration. They helped get the track teams stakes to hang the strings of bottles on. They also gave up some nylon rope and a needle-like tool to string the bottles. Caps were taken off the bottles and strung from the mouth of the container to the other end. Any water left in bottles was put in gallon-sized containers that would be used later in the demonstration. Approval from WCSA, the Student Involvement Office and B&G was needed for the demonstration. Once gained, on the night of April 15, 2015 students from the class helped set up. These were hung up along the protest that covered almost the entire expanse of the Jay. One string went from Corns Building to Beeghly library. Another was on the grass outside the Benes rooms. Another was in frony of the mural past Hamilton-Williams and the the last was strung in between the trees outside Chappelear Drama Center. The ones in the trees didn’t require the track team’s stakes to stay up and therefore, stayed up longer. The day of the demonstration was the water-focused day of Green Week. Most was taken down late April 16 and the stakes were returned to B&G early April 17. Originally, the goal was to find the money to replace the current dishwasher in Hamilton-Williams which is rather old. It was the first step to making Hamilton-Williams Market place more sustainable. The overall goal was to replace the dishwasher and introduce reusable containers to Market Place. Originally, I was looking into alumni to cover the cost of replacing the dishwasher, which was approximately 80,000. This was a difficult feat. I discovered it was difficult to find someone to fund something that isn’t easy to name after them. Therefore, with the help of Buildings and Grounds I was able to see the waste of the current dishwasher. They then did calculations to see how much money was wasted based on the lack of efficiency. The money being lost through water and electricity was enough to cover the cost of the lease for a new dishwasher. With the University saying that they would install the dishwasher over the Summer 2015 I changed my direction of the project to eco-containters. There was some previous work done on the containers but was halted due to the dishwasher not being able to be upgraded. Dan Magee was able to give me previous details about cost and ordering. With this I created a proposal plan for cost and the product. First, I looked into the different types of reusable containers. I found a company called Eco-containers that has previously worked with Universities on start up programs. This is when I found out that the Dan Magee had previously investigated this product. Therefore, I reached out to Dan to see what he had already collected on the materials and discussed with him his thoughts about how to implicate this product into Market Place. He and I both believed that totally eradication of the previous disposable to-go boxes was necessary for the eco-containers to be successful. I then began to research the financial side of the product. I asked for current spending reports on the disposable to-go containers. With this I was able to figure out on average yearly costs as well how many containers are being thrown away during a school year. I then researched the eco-containers and their life expectancy. 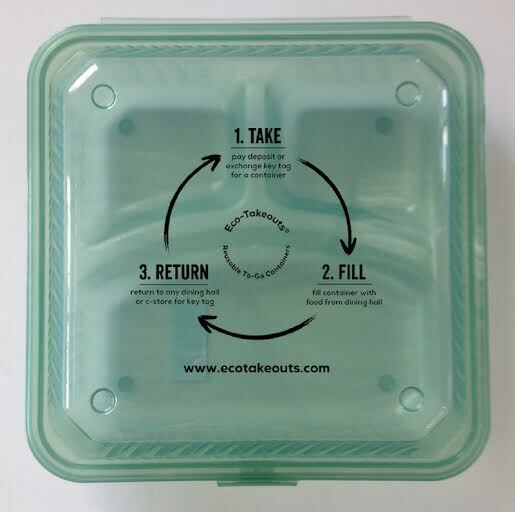 Each eco container can be used approximately 500 times before needing to be recycled. Therefore, even thought the initial cost of the eco-contaniers is higher than that of the disposable containers they become cheaper in the long run as an investment. Once I gained the help and support of Chartwells I brought the eco-containers to WCSA asking for their support and potential funding. WCSA was receptive as a whole and was able to help write letters to the Vp of Finance expressing their support of the project. They too agreed that the eco-containers had to be an all or nothing kind of approach. They were interested in the logistics of how the containers would be returned and what the proper incentive would be to return the containers. Eventually, the hope would be to incorporate the bar code that each box has on the back. However, to do that the school would need to update the registers. Each box would also have a logo on it depicting how the presses works and where they can be filled and returned. Article Posts: Some were posted in the same post. Therefore, there might be a project post at the bottom but I have double linked them. Nope- Thats what I have to say about this book. I felt like I was constantly waiting for it to begin. It was just back story and set up. Yes there were insightful parts about peoples perception on wilderness and that it does not have to be this pristine location away from people. That was a concept that was hard for me to grasp due to the fact that is how I grew up. I thought that wilderness didn’t include people so I enjoyed his perspective. Although, his descriptive language of these locations was rather odd. He spoke as if he was looking at the most magical naturally occurring scene when really he was looking at a garbage swamp outside of New Jersey. It was different and the book was dry but overall it did add to the questions the course was asking. But really.. did I meant ion that I didn’t like this book. I really enjoyed reading this book. When I started it I thought it was going to be vegetarian rand shamming meat eaters using shock factor to convert people. However, it was a much more personal account of someone journey and confusion about vegetarianism. Jonathan Safran was unsure about his own feelings about being a vegetarian and when he had a son he wanted to attempt to resolve his confusion. I think this book helped me with my own questions about being a vegetarian and answered other disturbing questions about food processing. I thought it was interesting how in the beginning of the book he started with a contraversial topic like eating dogs. By starting here the reader was forced to ask themselves hard questions. Such as ” Why am I okay eating one form of meat ( i.e chicken etc) and not another ( i.e dogs)”. This was his original argument that food is culture and culture affects our beliefs about food. I had to ask myself a lot about my own beliefs while reading this section. He further discusses our regard for some living creature vs others such as fish. Why do we disregard fish. he then argues that suffering is suffering and why do we allow fish to experience things that would be unspeakable violence if it was done to a dog. This next chapter also gave a lot of insight about bycatch and other fishing statistics. I found most of the details to be overwhelming. I thought I knew enough about industrial fishing but that wasn’t the case. I did feel like I knew more about industrial factor farms for livestock than I did about fishing and that stood true during his next few chapters. I did learn more about factory farming from this book though. Honestly, this book didn’t make it hard to eat meat but I thought it made it hard to trust people. I had a hard time understanding why we think it is okay as a society to treat living things in this manner. I really enjoyed this book and it was one of my favorites. Very thought provoking and eye opening. Week 10, Dinner at the Krygier’s! Week 11, Urbanik Placing Animals pt. 1 – I presented…. outside! Week 13, Veggie Dinner and Green Week Efforts! This project was an effort in retrofitting a retention pond to create a healthier ecosystem and to build more suitable habitat for native wildlife. This effort will be accomplished through cleaning litter around the pond as well as planting appropriate fauna. Ideally, the plants will nourish the area and prevent erosion which leads to sedimentation. In the end, we hope to see improved holding of soils around the pond, healthy plant life, and increased diversity of wildlife. 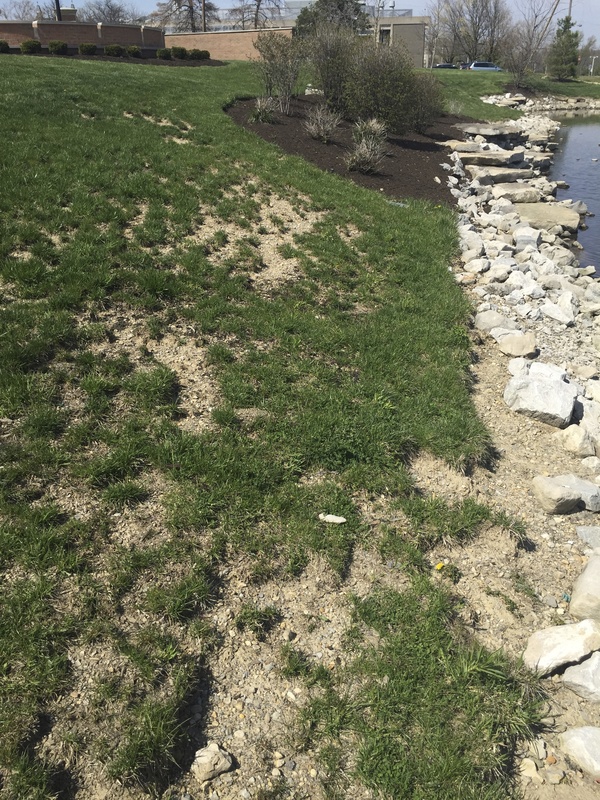 This project required interaction with Ohio Wesleyan University Buildings and Grounds, referencing professionals for information regarding plant species, and financial and planning support from the Friends of the Lower Olentangy Watershed (FLOW) Adopt-a-Pond program. Further results will likely be available Fall 2015. This project’s methods can be broken into 4 steps: it all began with gathering information, then strategizing action, next we will take action, and finally we will follow up and maintain the project. The information gathering stage primarily consisted of pursuing online research and meeting with others. The majority of the research I collected was related to retention pond structure and function, and previous reports of pond restoration. This information reinforced the importance of this project and confirmed that this project would be conquerable. Resources led me to believe that planting in the pond shallows would be a beneficial; however, we moved away from this idea following meeting with Peter Schantz of OWU B&G. Mr. Schantz was able to discuss concerns with planting from a maintenance perspective and provided preliminary approval for the continued pursuit of the project. Together we reviewed the pond blueprints. Water from behind Meek Aquatic Center flows into the pond through runoff and through 1 or 2 other large pipes. 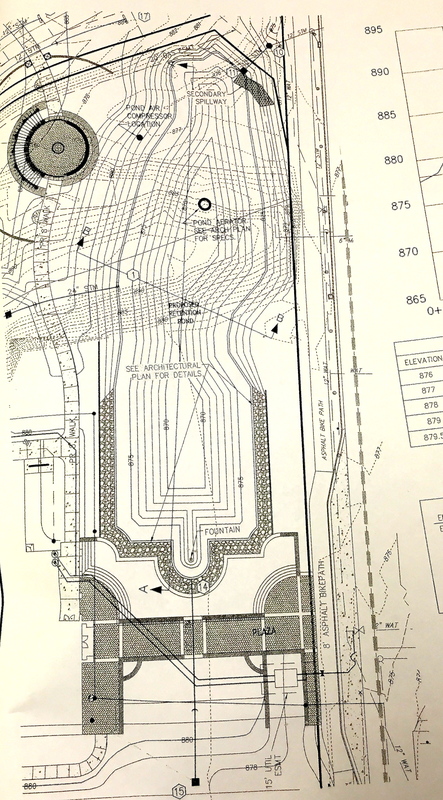 The pond is fitted with a fountain on the far end, an aerator near the middle, and the outflow pipe at the other end. The pond’s building instructions state that its bottom in 12in of silt clay. Mr. Schantz and inspected the pond and noticed a small, but consistent stream flowing out of the pond. We discussed choosing plants that would not produce excessive leaf litter, to avoid clogging drains and the aerator. We also discussed choosing plants that would not encourage excessive growth in the water. These two points were taken into consideration while choosing plants. The next step was to discuss the list of plants provided by FLOW (see Appendix A) with Dr. David Johnson who provided valuable information about each species and suggested a few preferred species. He is open to answering further questions related to this project. Following this meeting more information was gathered about species, especially pertaining to their root systems and seed/reproduction style. Next, we must choose locations for each species and run those choices by OWU B&G for approval. Then, the plants will be ordered as funded by FLOW and planted. We will likely need to reach out for assistance in planting, and upkeep of the plants. Tools will likely be borrowed from B&G. Then, plants will be watered and otherwise maintained to ensure their continued success and to stop any issues that may arise as early as possible. This project is still in progress! There may still be time to do things like taking a look at some water under the microscope in the lab or preserving a few samples for further study, as well as testing pH and oxygen levels, but this will require further support and contact with more university staff. As summer begins I’m still waiting to see how much time I’ll be able to carve out around my work schedule for this extra component. I think future work could include more monitoring of the pond’s success or an inventory of species making use of it. I would love to see a few bird boxes go up in the area. Future work might also involve increasing the number of plants and the species around the pond, if the initial plantings are successful.